Melt half the butter in a large deep saucepan cook lamb, in batches, until browned all over. Remove from pan. Melt remaining butter in same pan, cook onion, stirring until soft. Add pieces, cook stirring until fragrant. Add the water, stock and paste, bring to the boil. Return lamb to pan simmer covered for 1 1/2 hours stirring occasionally. 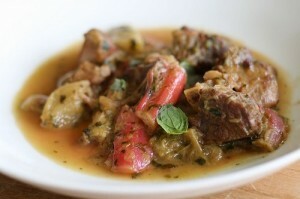 Uncover and simmer about 20 minutes or until lamb is tender. Add rhubarb to pan, simmer uncovered about 10 minutes or until rhubarb has softened. Stir mint into stew serve with rice, pasta or couscous. If you do this in a slow cooker, after you have browned the meat and onion etc, add ingredients to slow cooker and cook for about 3 hours on low, add rhubarb and cook for a further 30 minutes.